Monica Yvette Garcia has been working with, learned the language and culture of, and been influenced by the Deaf community in the greater Austin area since 2009. After attending the University of Texas, she received a BA in Anthropology and Communication and later became certified as Sign Language Interpreter with the State of Texas in 2015. She credits her ASL teachers, the Deaf community, and Interpreting mentors in bringing the knowledge of the language and respect of a respect for Deaf Culture into her life. During the meet, we'll play Babe Bingo, one of our favorite icebreakers. 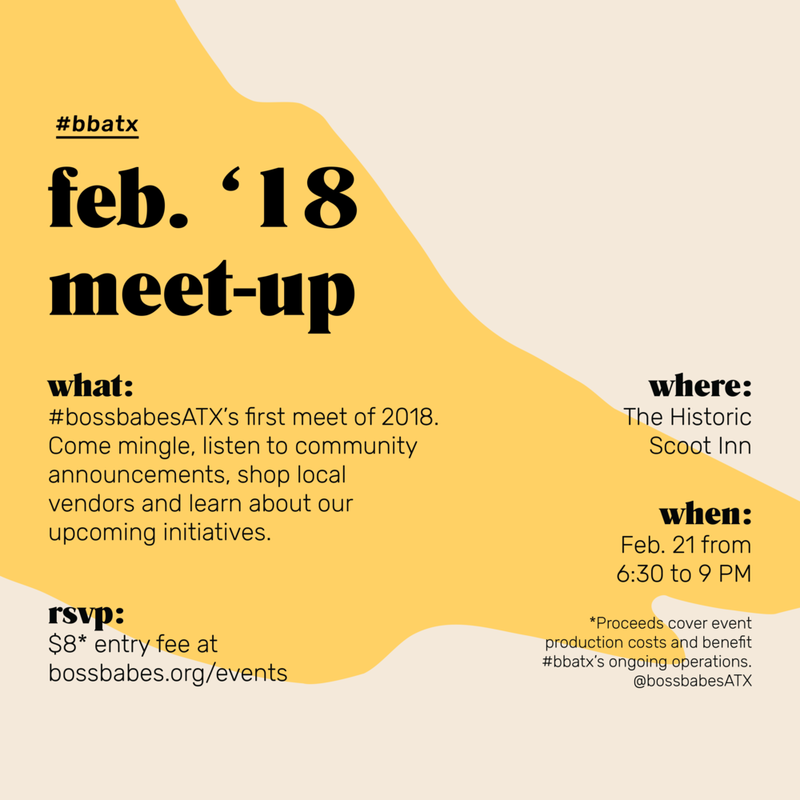 First to fill out their bingo card wins a #bossbabesATX tee! Texan Feminist, Support Women Artists and BABE AF tees will be available for $20. All purchases support the continuation of our programming. This month's topic question is What do you love most about yourself? Anonymous answers will be collected during the meet and later shared on our blog. Visit this portrait station for a commemorative snap. At every meet, we introduce an emerging artist based in Austin, Texas. For February '18, we've selected illustrator, animator and designer Alie Jackson; on top of a live installation onsite, Jackson's imagery will be sprinkled throughout the venue. Alie Jackson is an artist and award-winning designer residing in Austin, Texas. She has seven years of design experience working with big brands, blockbuster movies, music festivals, non-profits and small businesses. Her past and previous clients include Marvel, Universal Studios, Warner Brothers, Amazon Studios, ABC, Disney, FX, Home Depot, Office Depot, GSK, Sears, Boss Babes ATX, Juice Land, Texas Laser and Aesthetics, Sound on Sound Festival, Fun Fun Fun Festival, Margin Walker Presents, Transmission Entertainment and more. Currently, she's the Lead Designer at Project C. in Austin, TX. Previously, she worked for The Ryan Partnership (Currently Epsilon) in Chicago, IL as a Designer, Digital Asset Manager and Art Buyer. Farmhouse Delivery brings local, fresh and organic produce, top quality meat, natural pantry items as well as freshly prepared meal-kits right to their customers' doorsteps. They've been delivering and supporting Texan farmers since 2006. Known for their vegan avocado ice cream, Luv Fats will be poppin' up with sweet samples. Handmade and kiln-fired, Little Clay Studio creates custom infinity-bound necklaces (follow the process here). Created by DJ Breezah, Ginger + Judy is a hand-picked vintage collection featuring 80s and 90s digs. Shavanthe is a colorful multicultural clothing brand. Showcasing prints from all over the world, Shavanthe's line features dresses, necklaces, headwraps, hoodies and more. As an Indie, self-published, zine, The Audacity features work by artists, activists, and storytellers—from poetry to concept shoots. A photographer, illustrator and glitter addict. Lavie creates tattoo designs, illustrations and offer portrait sessions. Rejuvenate Bath & Body is a line of handmade products in Austin, TX. They strive to restore your natural beauty with the finest all natural ingredients. Carly Fischer will be popping up to supply tarot readings, with a portion of profit benefitting #bbatx's programs. *All proceeds cover our operational costs and event production costs. $8 pre-sale tickets are no longer available. $15 tickets will be available at the door. This production has been made possible in part by presenting partners the LINE ATX and Resplendent Hospitality.